Claire Benn’s works have been shown in public museums and commercial galleries on an international scale, they are also collected by private companies for displaying in corporate environments and by private customers to install in their homes. Most pieces are free-hanging, some are framed, each work is unique and signed. All of the work is abstract and contemporary with an elegant, reductive quality. Art textiles have the benefit of introducing 'softness' into 'hard' environments and have acoustic benefits as they absorb sound rather than bouncing it back into the space. If you are interested in collecting any of the works, please send your request or enquiry here. Fine Art - they are considered contemporary art as much as painting or sculpture, and are currently in vogue. Collectible - art textiles are as desirable and valuable as any other work of art. Sensual pleasure - they are tactile; everyone is connected to cloth from birth, so people love to touch them. 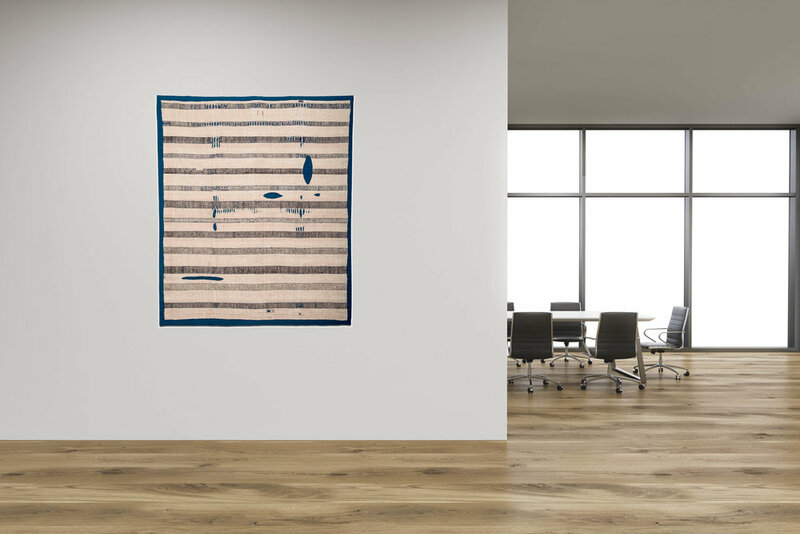 Acoustic benefits - art textiles absorb sound and radically reduce noise, creating calm and comfortable spaces. Quick installation - most are simply hung on a batten; some with a velcro attachment, some with a sleeve, and some are framed (usually without glass). Easy to store and move - simply roll them up on a tube and rolling cloth when moving or decorating. Easy to clean - gently shake them, gently beat them, gently vacuum them on the lowest setting.., and some can even be gently washed. Long-lasting - historical textiles are still around to be enjoyed today, and contemporary art textiles are no different in that respect.